Yoga is one of the 6 classical schools of Indian philosophy. All thoughts are being permeated by the highest and most general mind, by Paramatma. Paramatma is omnipresent what makes the individual human mind, Jivatman or Jiva, a part of it. Jiva is the individual self and defines the Atman, which gives life to the physical and subtle body. Moksha or Mukti refers to the enlightenment, which represents the last goal of life. The most important philosophical text, the Bhagavad Gita, describes (in chapter 6) the mind, the intellect, and the self (Ahamkara) what refers to the self-consciousness or identity-consciousness of a person without any reference to its specific individual properties or contents. which means: “Yoga provides balance and calmness on a mental basis in all vicissitudes of life” or “all is one – total equality”. Another text, the Sri Aurobindo, claims Yoga to be a methodical approach to reach self-perfection through the development of the own latent potential on the physical, vital, mental, and intellectual level. The way to broaden the boarders of the consciousness is the pursuit of controlling the mind as part of the self-purification. The Veda texts contain the (mostly dormant) body poses (Asanas), the merge of body and mind through breathing exercises (Pranayama), and energy-guiding hand and body poses (Mudras). It also includes the social and personal code of conduct (Yama and Nijama) as well as Dharana, which defines the focus of the mind on a particular object, the concentration. One part of the Veda are the Upanishads, which represent its core messages. These 4 elements build the bridge of life every Yoga practitioner, Yogi (male) or Yogini (female), has to cross. The Hand represents the Karma, our acting, the body. The Head represents the Gayan, our knowledge, the mind. The Heart represents the Bhatti, our devotion, the emotions. This goes along with the teachings of Buddhism that tell us that a balanced body forms the instrument to reach a balanced mind. In other words: we have to harmonize the body with itself first in order to balance the mind. Chitta is the consciousness, Vritti is the change/variation/pattern, and Nirodhah is the restraint. Together it means to “be restrained towards variations or changes in the patterns of consciousness” or in other words: to “block the pattern of consciousness”. Yoga calms the restless mind so that the energy can flow through more constructive channels. The systematic method to reach the meditative state is the Raja Yoga (or Ashtanga Yoga). There also are other equally important types of Yoga, like Hatha Yoga, Bhakti Yoga, or Karma Yoga. The methods can be combined. 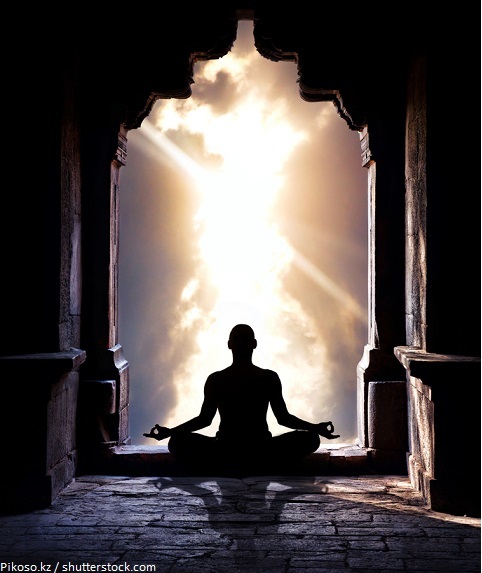 A brief history of Yoga philosophy: Yoga is one of the 6 classical schools of Indian philosophy. Learn more.